Which got me wondering about the scent of clove, one of my favourite spices. How does it work? After all, cloves are flower buds that come from a tree, and buds are not really known for being particularly aromatic – in the plant world this role is usually relegated to flowers. The clove tree (Syzygium aromaticum) is a tropical evergreen from the myrtle family, native to the Moluccas islands of Indonesia. 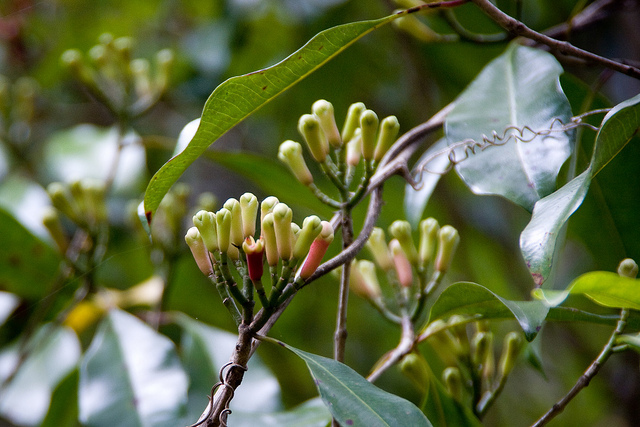 Most parts of this tree are fragrant – except for the red flowers and the fruits. However, the buds are a whole different matter. They are collected at a late stage of development, just as they’ve started turning a gentle pink hue. The organic compound responsible for the scent of cloves is called eugenol , and it’s a fairly complex chemical that comes from a class of compounds called phenylpropanoids, synthesised by plants from an aromatic protein building block – an amino acid. Plants create these compounds for a number of purposes – notably for deterring pests and diseases, as well as protection against ultraviolet light. Meanwhile they can also use the scent for attracting pollinators. Thus a smelly device clove trees use to protect their precious buds has become the reason why people pick them to use for cooking, smoking, and essential oil extraction. Clove oil has been used in different traditional medicines across the world for digestive problems, stimulation, ‘stomach coldness’, and toothache. However, it is considered there is insufficient evidence to show it is effective for any of these ailments – and more research is needed. It sure smells nice, though.